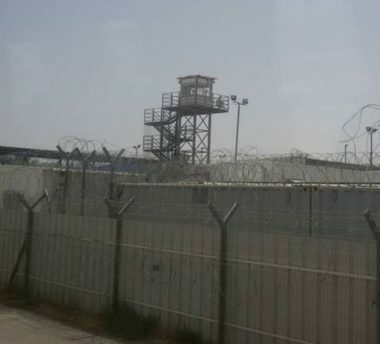 The Palestinian Prisoners’ Society (PPS) has reported that tension is escalating in Area A of the Negev Detention Camp, especially after the Prison Administration brought fire trucks and more troops to counter detainees’ protests. The PPS stated that one detainee, identified as Ibrahim Natsha from occupied Jerusalem, attempted to torch himself in protest of the deteriorating living condition, and escalating violations, in the detention camp. The detainee, who is serving a prison term of eleven years, suffered minor wounds and received the needed treatment. It added that, several days ago, the Prison Authority started installing scramblers to disrupt wireless signals, also affecting the detainees’ ability to watch TV stations or listen to the radio from the prison. This caused further tension between the detainees and the soldiers, especially amidst the dire living conditions the detainees face every day, and the repeated violation against them. The PPS warned that the army seems to be preparing for assaulting the detainees, especially after bringing fire trucks and more troops, like the assault that injured more than 100 detainees last month in Ofer prison. It warned that the situation in the Negev Detention Camp, where nearly 2000 Palestinian political prisoners are held, is constantly deteriorating, and called on various legal and human rights groups to intervene.